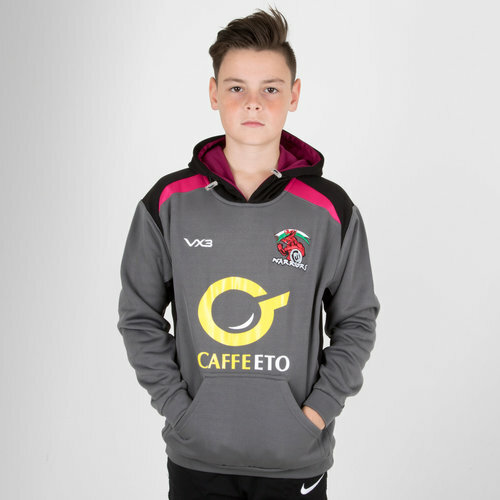 Show how much your team mean to you when you wear this Warriors 7s 2018 Kids Training Hooded Sweat from VX-3. Since their inception in the year 2000, the Carmarthenshire Warriors have evolved from a team of local players into one of the UK's leading invitational rugby 7s sides. The team have gone on to win at Rugby Rocks, Majorca Beach Rugby, Windsor 7s, Manchester 7s and 2 times Plate Winners at Cwmtawe. Furthermore, the team have been both Aberaeron and Newport Pembs champions numerous times. Many of the side's players have done so well that they regularly get invited to play at higher levels such as the IRB World Series and the JP Morgan series. This jumper has been designed from polyester with a light touch to the shell and even comfier feel on the inside. The mesh lining runs across the body and down the arms to create plenty of breathability. Complete with elasticated cuffs as well as a drawcord hood this hoody comes with a kangaroo pouch to keep valuables stored away safely. This jacket is ideal for both active and leisure wear. This hooded sweat is grey with black and pink features. The VX-3 logo is on the right whilst the club badge is on the left.